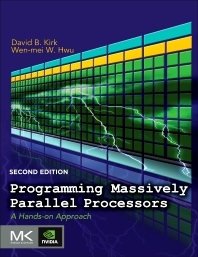 Programming Massively Parallel Processors: A Hands-on Approach, Second Edition, teaches students how to program massively parallel processors. It offers a detailed discussion of various techniques for constructing parallel programs. Case studies are used to demonstrate the development process, which begins with computational thinking and ends with effective and efficient parallel programs. This guide shows both student and professional alike the basic concepts of parallel programming and GPU architecture. Topics of performance, floating-point format, parallel patterns, and dynamic parallelism are covered in depth. This revised edition contains more parallel programming examples, commonly-used libraries such as Thrust, and explanations of the latest tools. It also provides new coverage of CUDA 5.0, improved performance, enhanced development tools, increased hardware support, and more; increased coverage of related technology, OpenCL and new material on algorithm patterns, GPU clusters, host programming, and data parallelism; and two new case studies (on MRI reconstruction and molecular visualization) that explore the latest applications of CUDA and GPUs for scientific research and high-performance computing. This book should be a valuable resource for advanced students, software engineers, programmers, and hardware engineers. 1.3 Why More Speed or Parallelism? David B. Kirk is well recognized for his contributions to graphics hardware and algorithm research. By the time he began his studies at Caltech, he had already earned B.S. and M.S. degrees in mechanical engineering from MIT and worked as an engineer for Raster Technologies and Hewlett-Packard's Apollo Systems Division, and after receiving his doctorate, he joined Crystal Dynamics, a video-game manufacturing company, as chief scientist and head of technology. In 1997, he took the position of Chief Scientist at NVIDIA, a leader in visual computing technologies, and he is currently an NVIDIA Fellow. At NVIDIA, Kirk led graphics-technology development for some of today's most popular consumer-entertainment platforms, playing a key role in providing mass-market graphics capabilities previously available only on workstations costing hundreds of thousands of dollars. For his role in bringing high-performance graphics to personal computers, Kirk received the 2002 Computer Graphics Achievement Award from the Association for Computing Machinery and the Special Interest Group on Graphics and Interactive Technology (ACM SIGGRAPH) and, in 2006, was elected to the National Academy of Engineering, one of the highest professional distinctions for engineers. Kirk holds 50 patents and patent applications relating to graphics design and has published more than 50 articles on graphics technology, won several best-paper awards, and edited the book Graphics Gems III. A technological "evangelist" who cares deeply about education, he has supported new curriculum initiatives at Caltech and has been a frequent university lecturer and conference keynote speaker worldwide.